Pepper Coast, also known as the Grain Coast, was the name given by European traders to a coastal area of western Africa, between Cape Mesurado and Cape Palmas. It encloses the present republic of Liberia. The Pepper Coast got its name from the availability in the region of the melegueta pepper, also known as the "grain of paradise", which in turn gave rise to an alternative name, the Grain Coast. 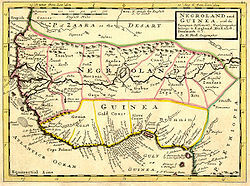 The importance of the spice is shown by the designation of the area from the Saint John River (at present-day Buchanan) to Harper in Liberia as the "Grain Coast", in reference to the availability of grains of paradise. In some cases (as shown on the map pictured above), this term covers a wider area incorporating Sierra Leone and the Ivory Coast. ^ Laurie's Sailing Directory for the Ethiopic or Southern Atlantic Ocean to the Rio de la Plata, Cape Horn, and the Cape of Good Hope etc., including the Islands between the two coasts (4th ed.). 1855. This Liberia location article is a stub. You can help Wikipedia by expanding it. This page was last edited on 16 January 2019, at 00:43 (UTC).